As the name suggests, our Squadron Baby Spring Wetsuit is the perfect outer layer for your baby or toddler when taking them out to the water during the spring season. Thick enough to still be warm, but not to the point where it may restrict movement, the Squadron Baby spring wetsuit is constructed from 3mm superstretch neoprene around the torso, with a 2mm thickness applied to the arms and legs to allow for increased flexibility. In addition to being quick drying, neoprene acts as a barrier against cold temperatures – providing excellent insulation across the body. The material traps a thin layer of water between the wetsuit and the wearer’s skin. This water is warmed by body heat and stays in place until the suit is removed. Our Squadron Baby Spring wetsuit uses flatlock stitching along the seams. This helps keep the wearer comfortable as it lays flat and avoids causing irritation. 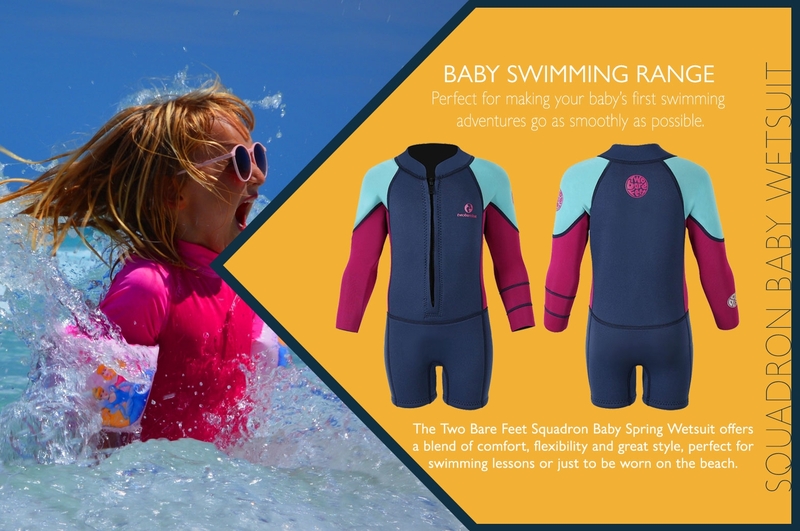 Unlike others in our range, the Squadron Baby Spring wetsuit wholly covers the arms, keeping your child safe, warm and protected from exposure to the sun’s harmful rays while in the water. As with all our other wetsuit lines, the Squadron Baby Spring wetsuit also sports a front chest zip, which allows for easy entry and exit while also preventing cold water from creeping inside. In terms of choice, four eye-catching colour schemes are available as well as sizing options to suit from extra small to extra-large. Please refer to our wetsuit sizing chart for more information. In addition, we also supply an optional swim pack with each wetsuit. This accessory bundle contains a bag for carrying your child’s gear, as well as a towel. The Swim Pack is available in a broad range of colours – we’re sure your child will find their favourite among these!